Saraqeb city is located in southeastern Idlib. On the first and second day of Al-Adhd Eid, the Syrian regime dropped more than 10 barrel bombs on the city targeting the vital centers. The main mosque and the northern mosque were targeted in addition to the city market, Al-Ihsan hospital, the city clinic, and the school of the southwestern neighborhood. All of these locations are civil centers. SNHR investigation showed that there were no military presence near those centers during or before the attack. 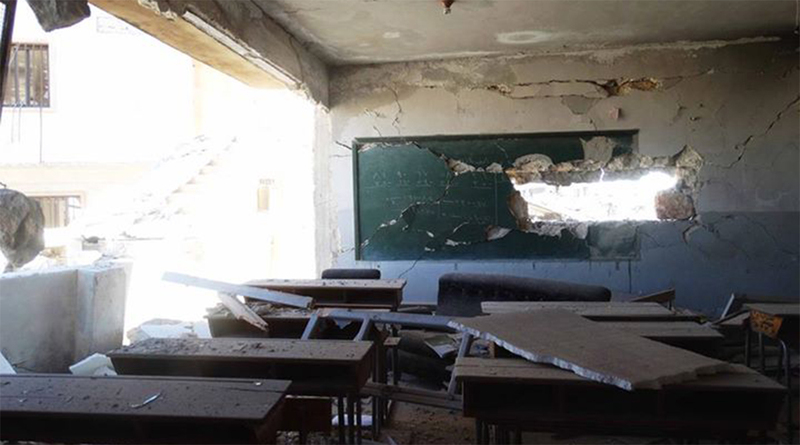 Furthermore, the airstrikes targeted a school in the northern neighborhood. The school was a military headquarter for the armed opposition before it was evacuated a month ago.